Property Size 1,085 sq. ft. This is Simple Pleasures. When you stay in this cabin, you will find that the pleasure you feel is anything but simple! Enjoy the spectacular mountain view from any of the 3 decks or the hot tub. After dark, spend some quality time with the family around the fire pit or play foos ball inside. Beautiful decor, comfortable beds and furniture fill the cabin making it inviting and homey. We are sure that Simple Pleasures will make your vacation the best you`ve ever had! 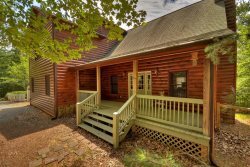 Amenities: Screened Porch, Hot Tub/Jacuzzi, Dishwasher, Washer, Dryer, Phone, Microwave, Coffee Maker, Satellite TV, DVD, VCR, Gas Grill, Gas-Firepit, Wood Burning Firepit and Hammock. TV`s: LivingRoom, Master Bedroom, Main Floor Bedroom, Second Bedroom (for games only), Basement Den 52"